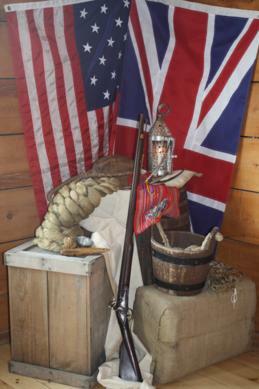 The provincial historic attraction Discovery Harbour re-creates the days of the British Navy and Military on Penetanguishene Bay, from its beginnings late in the War of 1812 until it was turned over to the Canadian government in 1856. The Penetanguishene Naval Establishment was a result of the War of 1812, declared by the United States in June of that year, against Great Britain. British Command felt it vital to build a strategic outpost and shipyard to guard the flow of supplies and men north to British outposts and First Nations allies. Eventually, it evolved into a naval and military base to maintain colonial defence. 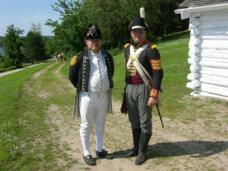 There were no battles fought with the Americans at Penetanguishene. In 1793, the first Lieutenant Governor of Upper Canada, John Graves Simcoe, noted Penetanguishene’s potential as a harbour. To that end, lands surrounding Penetanguishene Bay were purchased from the Chippewa (Ojibway) First Nation in 1798. The long, narrow bay was chosen for a new British Naval Dockyard in the fall of 1814 by British Commander, Sir George Prevost. The American victory over the British Fleet on Lake Erie in 1813 made the establishment of such a base more important. Originally the Nottawasaga River was the British depot on Georgian Bay, but the sinking of the British schooner Nancy by American ships there in 1814, showed its vulnerability. Penetanguishene was defensible and much better suited for a naval shipyard. In late 1814, the initial plans for the Penetanguishene Naval Establishment included building a 36 gun frigate, to help maintain British superiority on Lake Huron. This resulted in the clearing of the Penetanguishene Road which would allow the transport of ship-building supplies and men from Kingston via York, north to Lake Simcoe and then to Penetanguishene Road, versus an earlier route involving Lake Simcoe, Fort Willow Depot and Nine Mile Portage to Nottawasaga. But in March of 1815 when news of peace finally reached Penetanguishene orders were given to stop all operations. The frigate was never built and the anchor was abandoned en route at Holland Landing. Only a few crude huts had been constructed. Although the Treaty of Ghent between the United States and Great Britain had been signed December 24, 1814, the news was delayed in reaching Penetanguishene for almost three months. Despite the peace, the British still needed a naval presence on Lake Huron, as tensions remained between the U.S. and Britain. With the closing of Nottawasaga, attention returned to Penetanguishene and major development began in 1817. Its priorities were to maintain the supply routes to the upper lakes, keep a watchful eye for American vessels, and to maintain the two 124 foot transport ships, H.M.S. Tecumseth and H.M.S. Newash. With the Rush-Bagot agreement between the United States and Great Britain, restricting the size and armaments of vessels on the Great Lakes, Tecumseth and Newash were ordered into a state of ‘ordinary’…(decommissioned and all masts and armaments removed, but maintained in a state of readiness). By 1820, the Penetanguishene Naval Establishment was home to over 70 personnel, including sailors, officers, a Military guard, and civilian shipwrights, sawyers, blacksmiths, and oxen drivers. Samuel Roberts, Captain of the Penetanguishene Naval Establishment 1820-22, had fought against the Americans in the War of 1812, in Virginia, Baltimore and New Orleans. Assistant Surgeon Clement Todd was wounded in action on Lake Champlain (presumably in the failed British attempt to capture Plattsburgh, N.Y., in the fall of 1814). He served at Penetanguishene from 1819 to 1827. Lieutenant Henry Bayfield was on board one of the British ships on Lake Champlain late in 1814. He was based at Penetanguishene from 1820 to 1822. Over the following years and with a general warming of relations with the United States, there was a reduction in personnel and expenditures until the British Navy formally withdrew from Penetanguishene and Canada in 1834. The British Military presence at Penetanguishene began in 1828 with the relocation of the British Regiment from Drummond Island, when the island was ceded to the Americans during boundary negotiations. The majority of the regiment came to Penetanguishene, along with many Métis families who were connected with the Drummond Island base. Métis descendants still live in the community today. In 1856, Britain decided it could no longer afford to finance military expenditures in the Canadas. 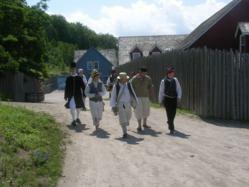 All the establishments, including Penetanguishene, were closed and the lands handed over to the Canadian government. Ashley, Clifford W. The Ashley Book of Knots. New York: Bantam, Doubleday, Dell Publishing Group, 1944. Banks, Steven. The Handicrafts of the Sailor. N.Y.: Arco Publishing Company, Inc., 1974. Barnett, Corelli. Britain And Her Army: 1509 - 1970. London : The Penguin Press, 1970. Berton, Pierre. The Invasion of Canada. Toronto: McClelland and Stewart, 1980. Berton, Pierre. Flames Across the Border: Toronto: McClelland and Stewart Ltd., 1981. Best, G. Mid - Victorian Britain: 1851 - 75. London: Weidenfeld and Nicolson, 1971. Bourne, Kenneth. Britain and the Balance of Power in North America: 1815 - 1908. Los Angeles: University Of California Press, 1967. Brett - James, Antony. Life In Wellington's Army. London: George Allen and Unwin Ltd., 1972. Cain, Emily. Ghost Ships. Toronto: Musson (A Division of General Publishing Group), 1983. Day, A.. The Admiralty Hydrographic Service 1795 - 1919. London: Her Majesty's Stationery Office, 1967. Day, Cyrus Lawrence. The Art of Knotting and Splicing. Annapolis: The Naval Institute Press, 1955. Fincham, John. A Treatise on Masting Ships and Mast Making. London: Conway Maritime Press Ltd., 1829. Gaskell, P. The Manufacturing Population of England. New York: Arno Press, 1972. Hammond, J.L. and Barbara. The Town Labourer 1760 - 1832. London: Longmans, Green and Co., 1919. The Village Labourer. London: Longmans, Green and Co., 1919. Harland, John. Seamanship In the Age Of Sail. London: Conway Maritime Press, 1984. Harrison, J.F.C. The Early Victorians: 1832 - 51. London: Weidenfeld and Nicolson, 1971. Horsman, Reginald. The War of 1812. London: Eyre and Spottiswoode Ltd., 1969. Houghton, W. The Victorian Frame of Mind. New Haven: Yale University Press, 1971. Hunter, Andrew F. The History of Simcoe County. Barrie, 1948. Jury, Elsie McLeod.The Establishments at Penetanguishene: Bastion of the North 1814 - 1856.Bulletin of the Museum of Indian Archaeology, University of Western Ontario. No. 12, 1959. Kemp, P. The Oxford Companion to Ships and the Sea. London: Oxford University Press, 1969. Lavery, B. Nelson's Navy. London: Conway Maritime Press Ltd., 1989. Lever, Darcy. The Young Sea Officer's Sheet Anchor. New York: Edward W. Sweetman Co., 1963. Lloyd, C. The British Seaman. London: Granada Publishing Ltd., 1968. Longridge, C. Nepean. The Anatomy of Nelson's Ships. Annapolis: The Naval Institute Press, 1961. Mahan, Capt. 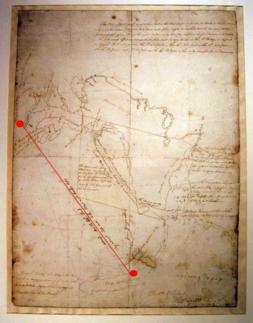 A. T. Sea Power In Its Relations To The War Of 1812. Vols. I and II. London: Sampson Low, Marston and Company Ltd., 1905. Masefield, John. Sea Life In Nelson's Time. London: Conway Maritime Press Ltd., 1972. Neff, W.F. Victorian Working Women. London: Frank Cass and Co., Ltd., 1966. Rodger, N.A.M. The Wooden World. London: William Collins, 1986. Roosevelt, Theodore. The Naval War of 1812. Annapolis: Naval Institute Press, 1987. Smith, Hervey Garrett. The Marlinspike Sailor. New York: John de Graff, Inc., 1960. Spencer, Chas L. Knots, Splices And Fancy Work. Glasgow: Brown, Son and Ferguson Ltd., 1964.